Even in this tech-saturated digital age, most people still use a written check every now and then to pay a bill or buy something new. I find that nostalgic and very refreshing. Plus, writing a check is about the only opportunity I have to use cursive! Here’s the thing though. I despise those tacky plastic checkbook covers that come with every box of new checks. So I did what any normal, savvy sewing person would do. 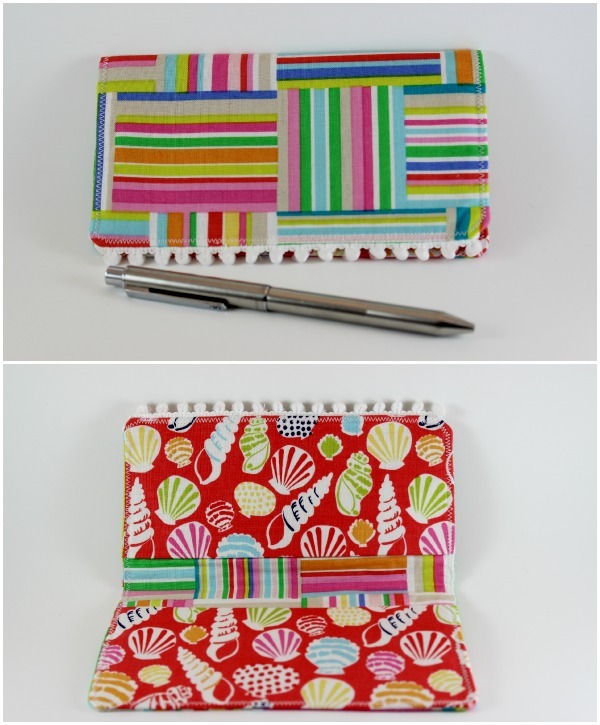 I made my own and wrote a Simple Decorative Checkbook Cover Tutorial to share with you! 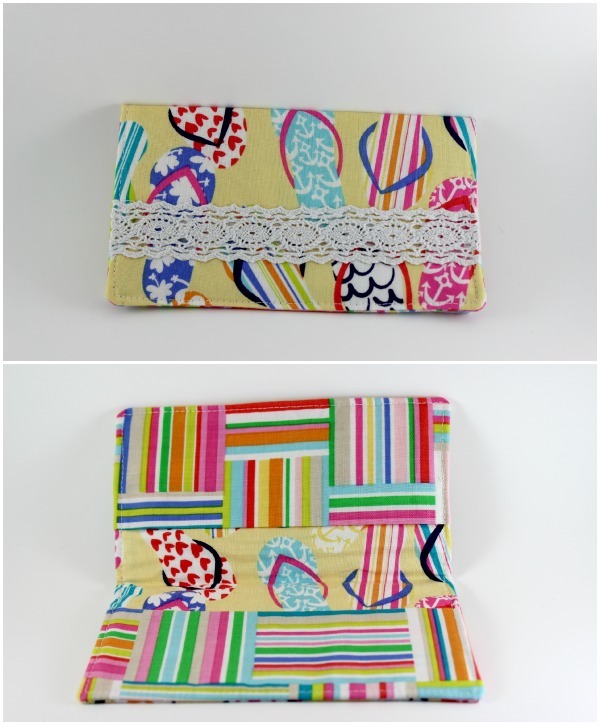 This checkbook cover project can be made with just a fat quarter of fabric and less than a quarter yard of lightweight interfacing. Add some decorative trim, ric rac, or piping to the pleat detail to give it a unique and fun style. 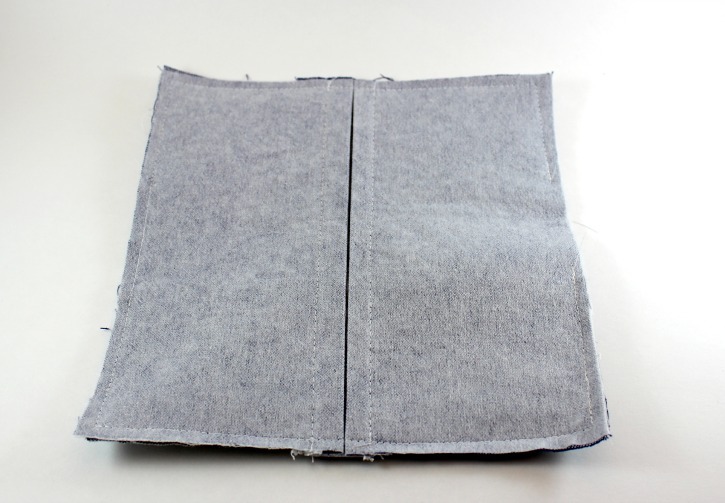 It’s so quick and easy to sew that you’ll have a half dozen or so made in no time like me! 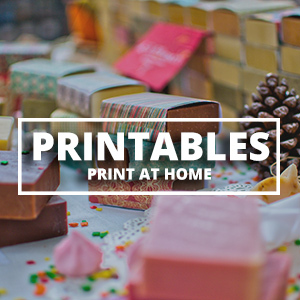 These are ideal to give your mother or any special woman as a gift on Mother’s Day. 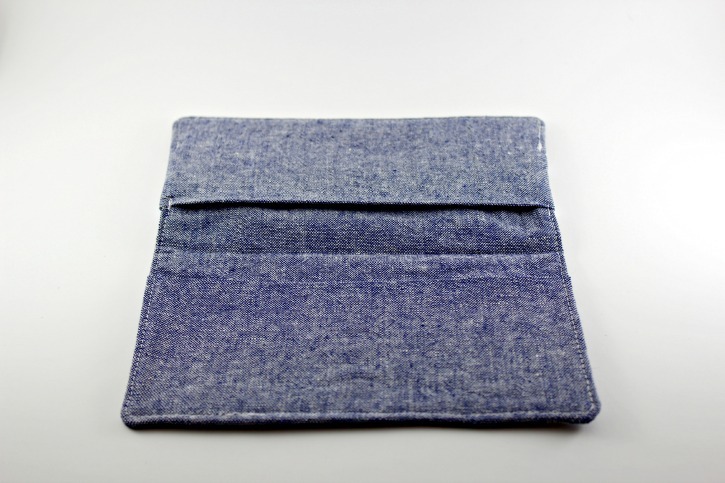 Pretty much any type of light to medium weight fabric will work well to make a checkbook cover. 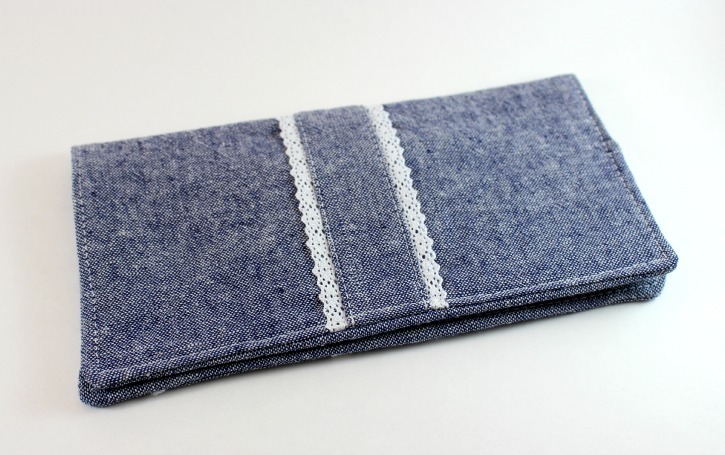 For the main one shown in the tutorial below, I used a denim blue yarn-dyed Essex Linen by Robert Kaufman. Chambray and quilting cotton from the Sun-sational collection by Maude Asbury for Blend Fabrics were used for the other checkbook cover variations shown at the end of the tutorial. 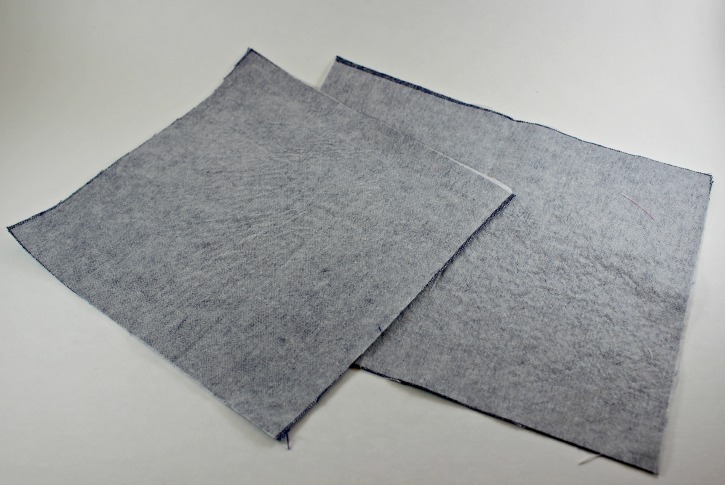 After cutting out fabric and interfacing, fuse interfacing to the wrong side of the Outer and Lining pieces. 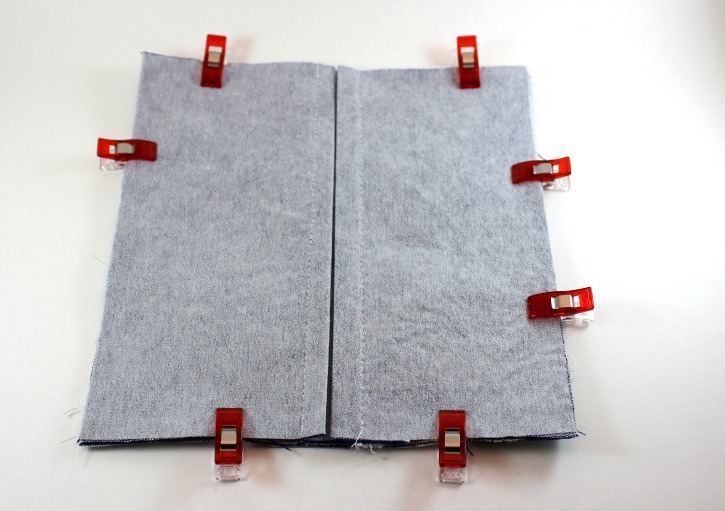 If you chose to interface the Pockets as well, fuse interfacing to those pieces. 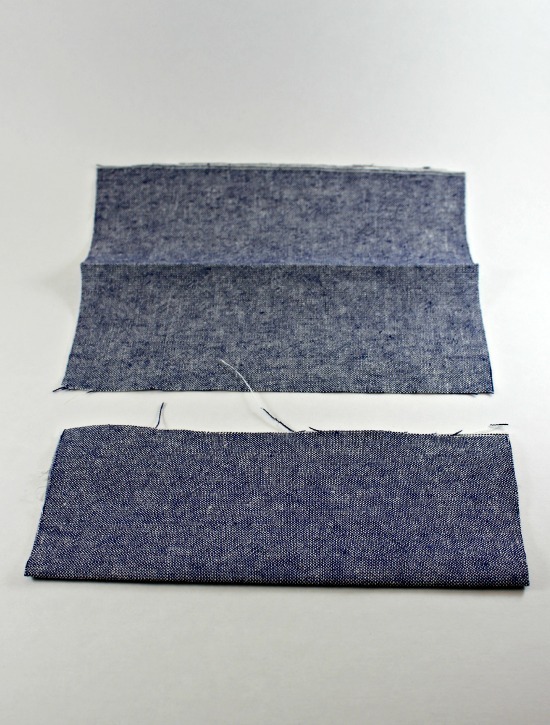 Fold both Pocket pieces in half with wrong sides together (WST) to make them 7 1/4″ wide x 3″ long. Press. Set aside. 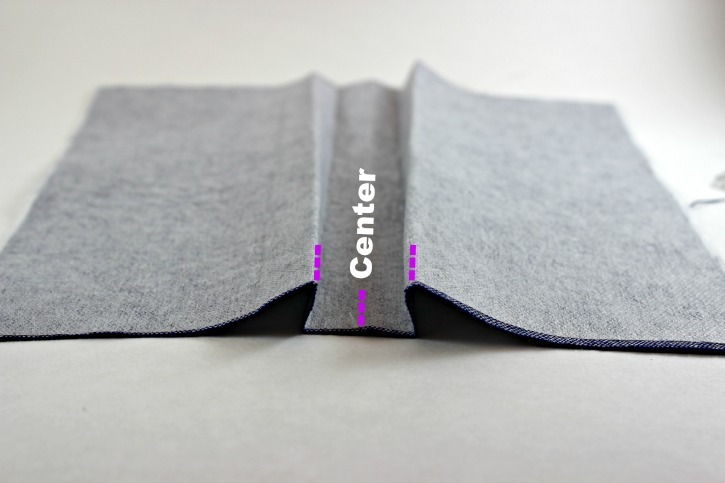 Fold the Outer checkbook piece in half WST along the width (longest side). 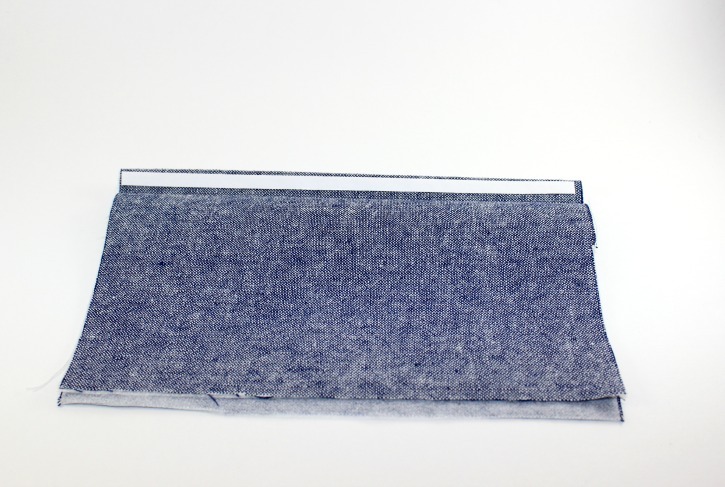 Finger press and mark along the fold using a fabric marker. 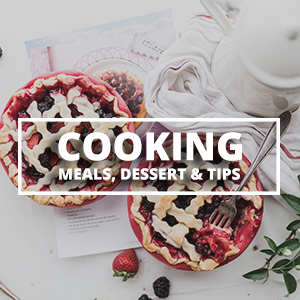 Open the Outer piece back up and place a mark 1/2″ and 1″ from either side of the center on both long edges. It is helpful to make these marks on both sides of the fabric. 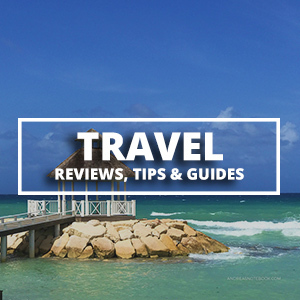 With WST, fold the Outer piece along the 1/2″ mark to the right of center. Press. 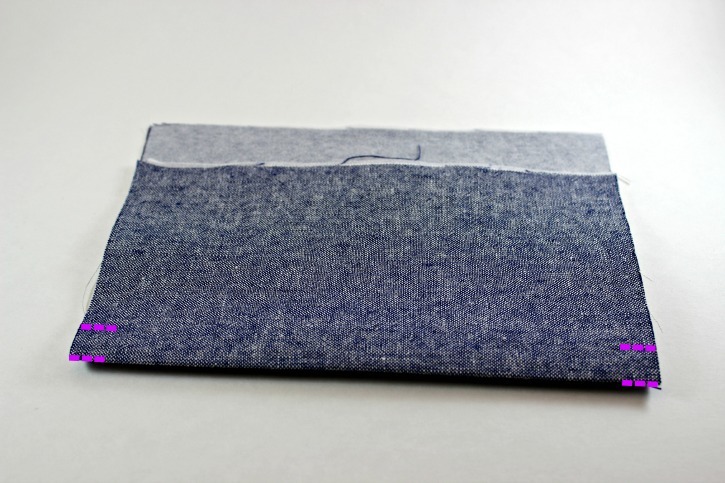 Create a pleat by folding the fabric with right sides together (RST) along the 1″ mark. 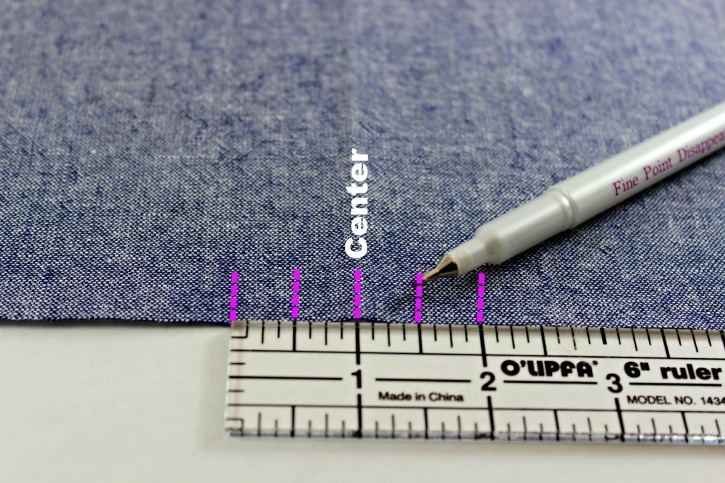 Press the pleat toward the center mark on the wrong side of the fabric. Repeat Steps 5 and 6 for the marks to the left of the center fold. 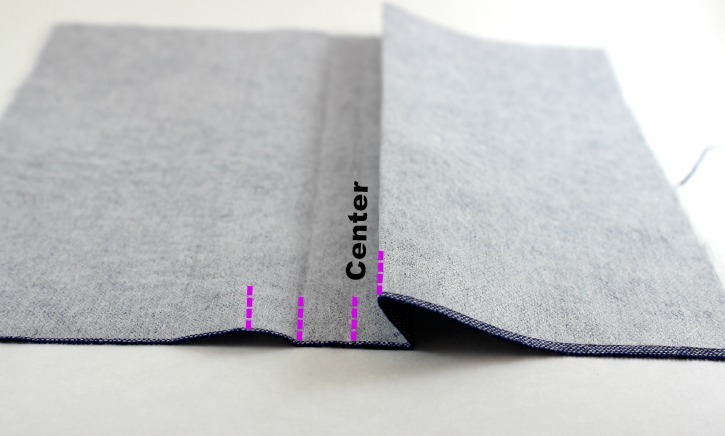 The 1″ pleats should meet along the center mark on the wrong side of fabric when pressed. Turn the Outer piece so the right side is facing up. 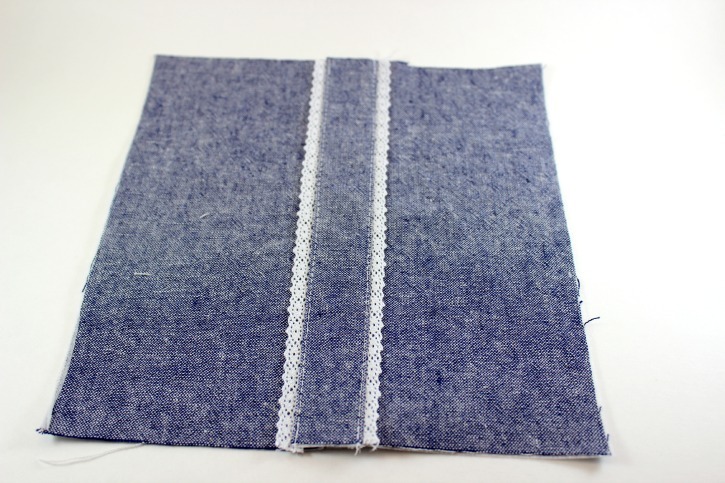 Fold up each edge of the pleat and place a strip of Wonder Tape close to the edge. Remove the backing from the Wonder Tape and position your trim on each side. Topstitch the trim and the pleat in place. 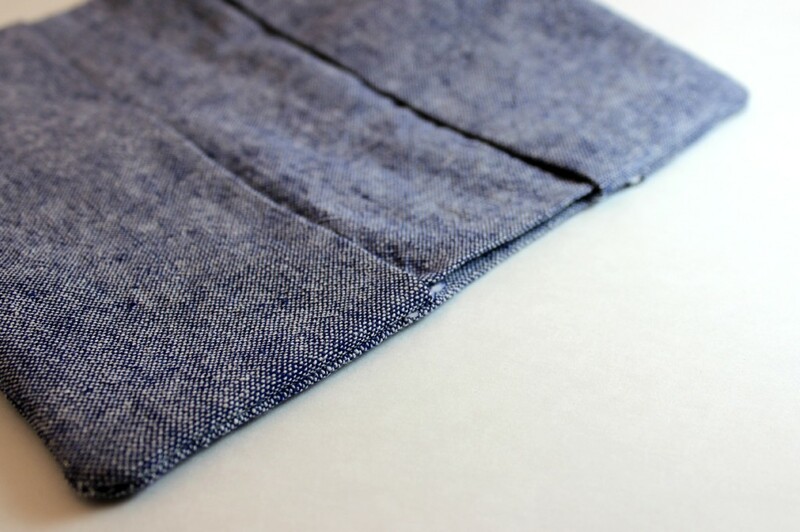 Place each folded Pocket on the right side of the Lining being sure to match raw edges. Baste the Pocket pieces in place. Place the Outer and Lining pieces RST. Pin or clip around the edges. 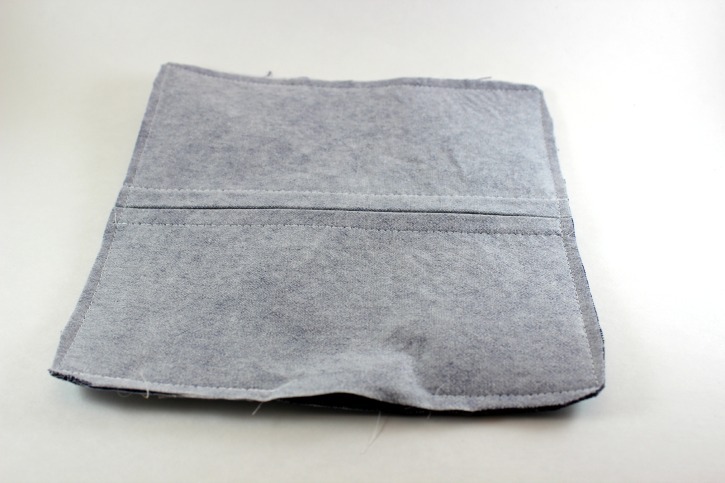 Using a 1/4″ seam allowance, sew around the edges of the checkbook cover being sure to leave to 3″ opening along one edge for turning right side out. Trim edges to 1/8″ and clip corners to reduce bulk after turning. 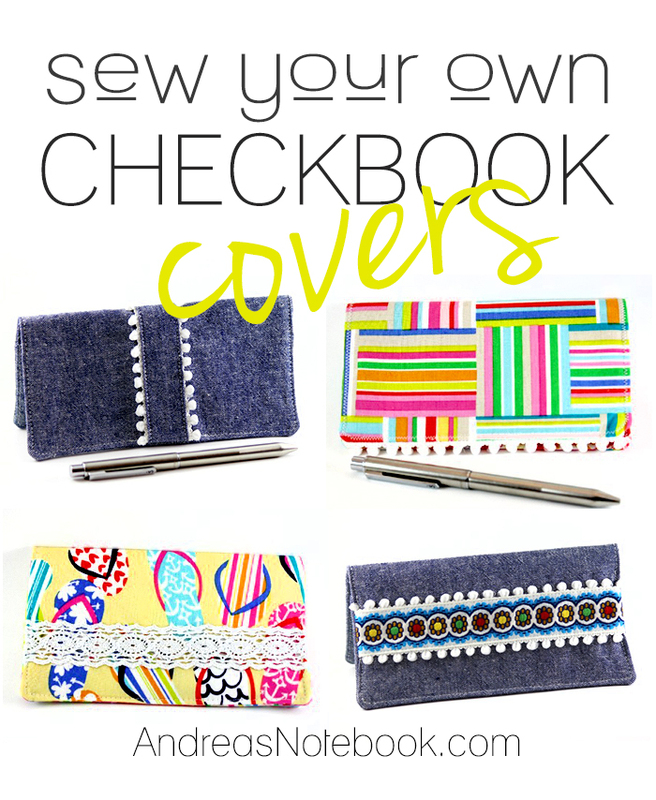 Turn the checkbook cover right side out and thoroughly press. Make sure the fabric at the opening is turned in neatly. Pin or use Wonder Tape to keep the opening closed. 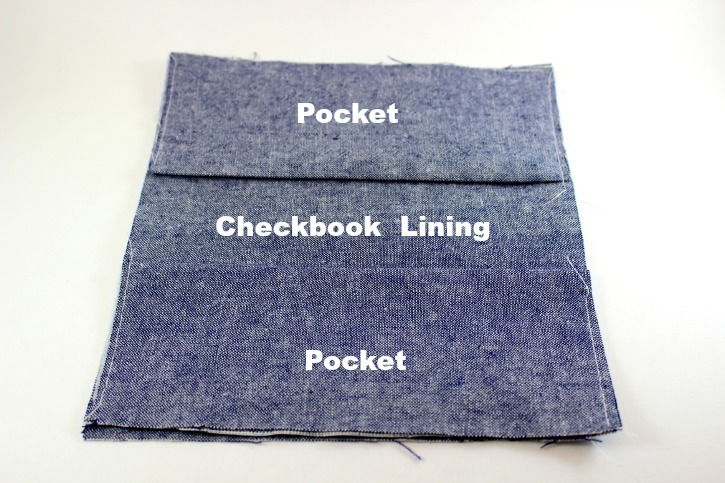 Topstitch around the entire perimeter of the checkbook cover using a 1/8″ seam. 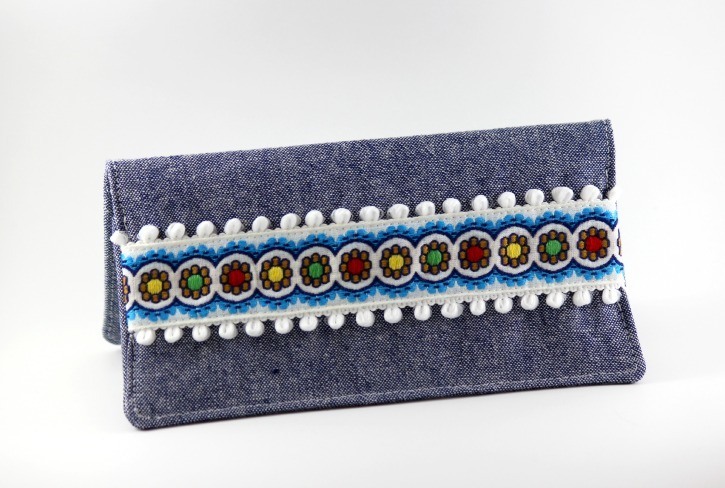 This will also stitch the opening closed. 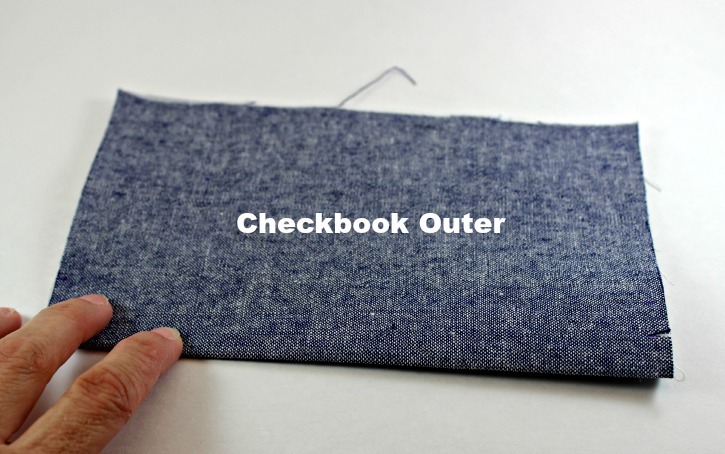 Open the checkbook cover and slip your checkbook into the bottom pocket and your register into the top pocket. 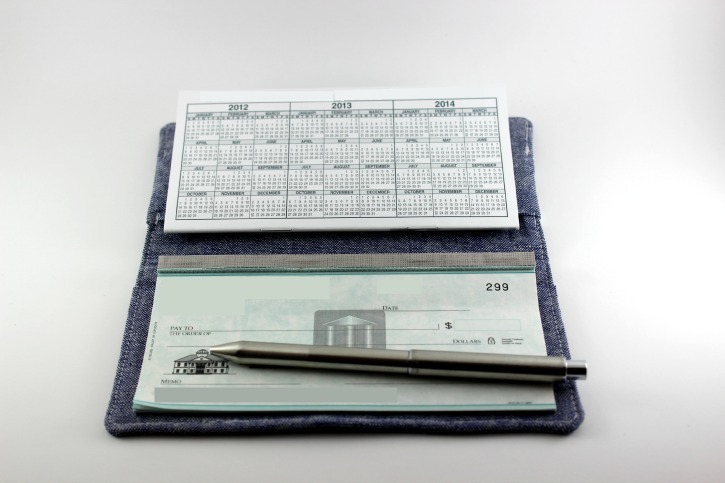 The overall finished dimensions of the checkbook should measure approximately 6 3/4″ wide x 7″ long when open. I told you these were a breeze to sew! I literally cut this one out and sewed it in 15 minutes. 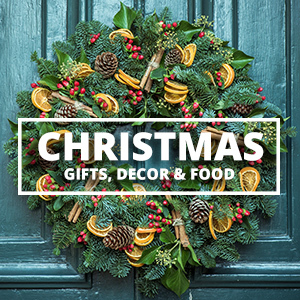 It was so quick and easy to make, that I just couldn’t stop! I had fun making a couple more just like the one above, but I also made a few others with some simple variations to the instructions. 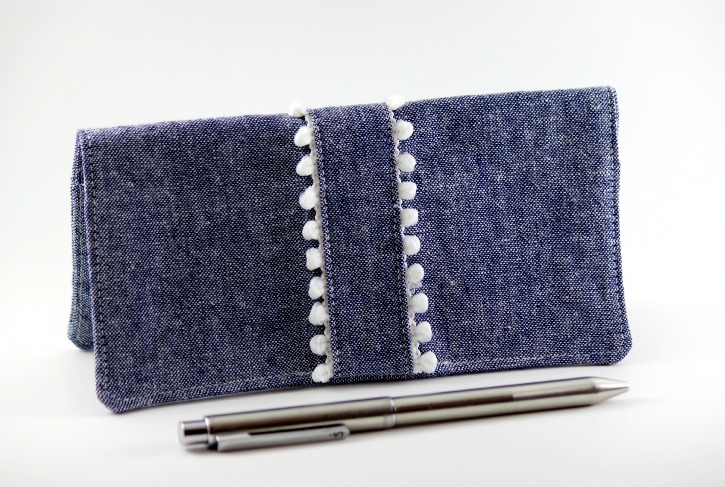 Make a plain checkbook cover with no pleat by omitting the Outer piece and cutting out 2 Lining pieces instead. Add some pom pom trim or ric rac to the front edge before sewing the two Lining pieces together and turning right side out. 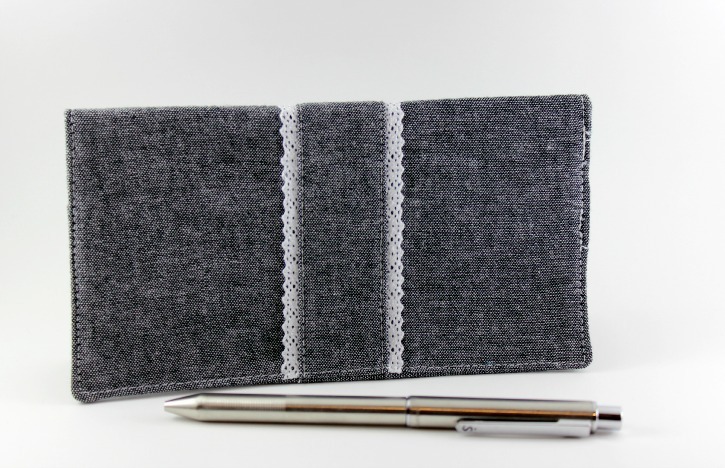 Make a plain checkbook cover with no pleat by omitting the Outer piece and cutting out 2 Lining pieces instead. 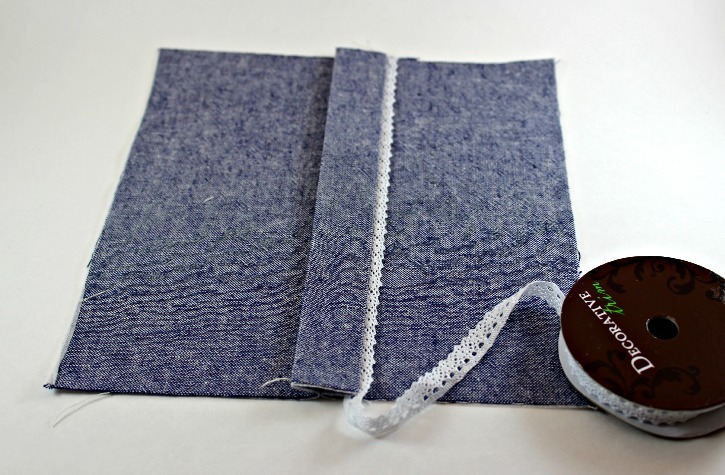 Sew a piece of ribbon, lace, or other trim horizontally across the front cover before sewing the two pieces Lining pieces together and turning it right side out. 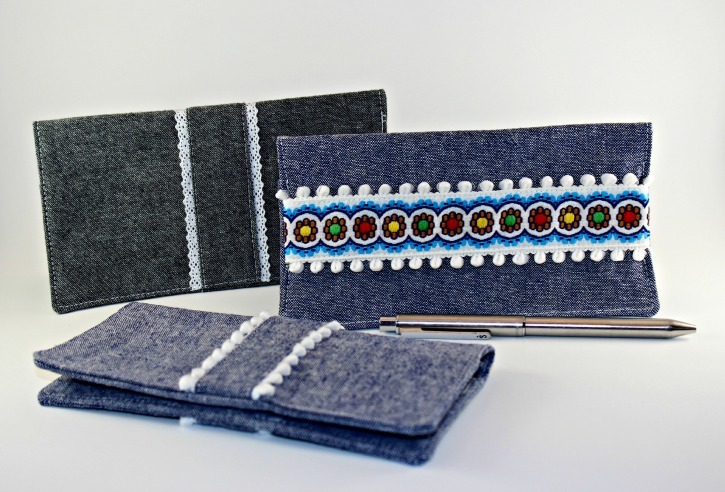 So dig through your bin of trims and see what kind of checkbook cover you can create. I bet you’ll be like me and find it difficult to stop at just one! Veronica grew up in the South with a mom, grandmother, aunt, and host of other relatives who all sewed. It's only natural that she now has a passion for sewing herself. A few years ago, Veronica gave up a career as a civil engineer to be a stay-at-home mom and sewing blogger who now uses her design skills to create sewing tutorials, clothes for her daughter, and handbags for herself! 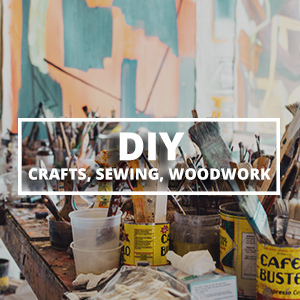 Check out her free tutorials, pattern reviews, and patterns for purchase on her blog, sewVery. Why have I never thought of this? Super cute! It is great that you describe such things.